When it comes to luxurious African wildlife adventures, Roving Bushtops has become synonymous with the highest standards in safaris. Our exceptional camps are bywords for Wild Luxury – two short words that summarize the perfect 5-star luxury safari experience. Wonderfully situated for the annual wildebeest migration, all Roving Bushtops camps deliver a year-round blend of fantastic cuisine, superb facilities and stunning game viewing. 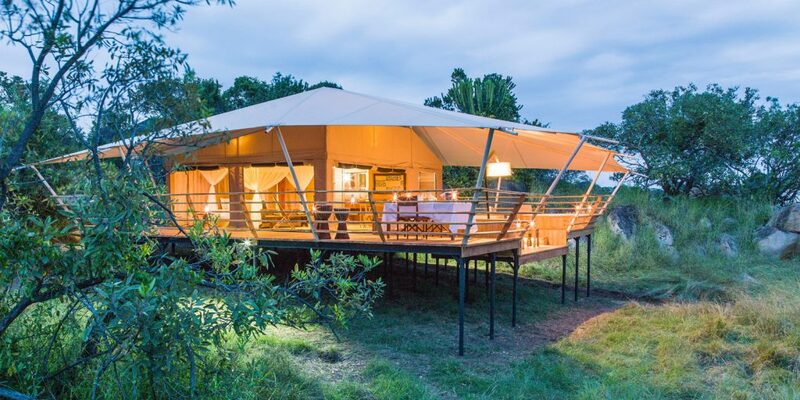 Roving Bushtops tented camps are havens of peace and comfort, offering the finest of facilities. Whether tracking prides of lions, staring in awe at elephants, spotting the elusive rhino, marveling at the grace of a leopard or simply watching buffalo herds, nothing on earth comes close to time spent in the bush, guided by experts and transported in Africa’s best-equipped safari 4x4s. Roving Bushtops tents are simply extraordinary. Each boasts a hundred and twenty square meters of luxurious living space, providing ample room to wander at leisure, sink into a deck lounger, soak in your private hot tub or gaze out at passing wildlife. Spacious and beautifully furnished, each offers true five star luxury within a canvas canopy – but with space and views no hotel could hope to match. This is your personal realm, ideally suited to restful sleep, taking an open-air shower beneath the warm African sun, unwinding as you await drinks from your private butler, or perhaps purring under your masseuse’s strong fingers, after an exhilarating day on safari. Solar power and a generator back up ensure constant electricity is on tap within your tent and across the camp.